The coquettes, among the smallest of hummingbirds, are always a prize to see. They are not all that common, and males are adorned with just the most amazing garb. This is the Frilled Coquette, photographed in southern Brazil by guide Rose Ann Rowlett. The fantastic center of avian endemism in eastern Brazil, particularly well endowed with hummingbirds, cotingas, antbirds, and beautiful scenery. Part I: North of the Tropic; Part II: South of the Capricorn, plus an optional Iguazu Falls Extension. Do you think cotingas are, shall we say, alluring? 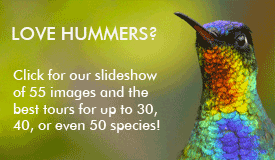 Would you describe hummers as some of the most fabulously brilliant and inspiring jewels in the natural world? Are you thrilled by birding's simpler pleasures, like walking down a misty mountain trail at dawn having no idea whether you're going to see a bamboowren, a bristlefront, or a streamcreeper...or by the idea of a wilderness happy hour attended by owls and nightjars? Do you occasionally dream of being under a warm, tropical forest canopy...instead of your neighborhood after another hard freeze? If you answered "yes" to more than one of these, then you'll have the tropical birding time of your life on these tours! Southeast Brazil is an especially exciting place to bird because it has such a wealth of unusual endemics, many among the rarest birds on the continent and some on the lists of the most critically endangered species in the world. The northern-hemisphere fall is spring in Brazil, and these tours leave few bromeliads unscrutinized as we search the Atlantic Forest for the approximately 180 species of birds that live only there (we regularly see over 170 of them!). Part of the fun is meeting the enormous challenge of finding and seeing well all of these incredible birds--indeed, we'll cover a lot of eastern Brazil. Along the way, we'll stay in some charming places, revel in the beauty of mossy mountain forests, and eat like kings. We do it just right with a month-long journey split into two tours at the Tropic of Capricorn (about 23 degrees South latitude), the official division between the Tropics and the South Temperate Zone. North of the Tropic takes us through the tiny but mighty (birdy, that is!) states of Espirito Santo and Rio de Janeiro plus far northern Sao Paulo. South of the Capricorn picks up from Sao Paulo and runs south through the gaucho country of Rio Grande do Sul, settled by Italian and German immigrants and so culturally different from the north. These tours are perfect complements! Whether joining one or both, be sure your seat back's up and tray table stowed, and come on down to Rio! And if you're wondering why we didn't list a ton of bird names, we decided to put them in the detailed day-by-day itinerary so you'll have time to read something else today. Our Iguazu Falls Extension takes us to one of the world's most spectacular natural features--and it also happens to be a great birding area! Good to fine accommodations, easy to moderate terrain, warm to cool climate.